"Easy, delicious, wonderful on cold winter days or anytime!" Place meat, corn, green beans, carrots, potatoes, tomatoes, soup mix, and salt and pepper to taste into the slow cooker; stir to combine. Cook on LOW for at least 6 hours. Add water if necessary. 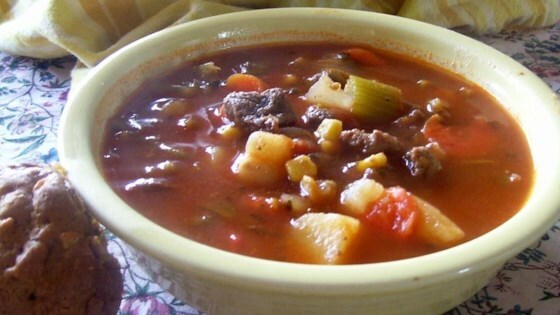 A hearty beef and barley soup loaded with plenty of vegetables. People.. this recipe works! I didn't add the canned veggies @ first, did add the liquid though. The veggies themselves didn't get added until 2 hours into cooking. If you don't like a lot of tomato flavor, you might want to try a smaller can of crushed tomatos. Otherwise, excellent! We've cooked this several times, and love it! I use canned lima beans instead of green beans and use two cans of sliced or whole potatoes instead of one.